Next in the series on Holston Mountain Beef Jerky is this Hawaiian variety. See my previous review of their Original variety. Holston's Hawaiian variety seems to be a very popular commodity, at least everytime I visited their website in the past, I'd see a notice that said "out of stock". So when I finally saw it listed without that notice, I figured I'd better buy some right now. As it turned out, they didn't have any in stock, but asked if I'd be willing to wait. Of course I said, "yes". 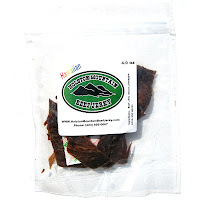 Holston Mountain is a small jerky manufacturer based out of Bluff City, TN, run by a guy named Gary Graybeal, who had been making jerky for himself for several years, until friends urged him to start selling it. Holston has been in operation for the past six years. Beef, soy sauce, pineapple juice, and spices. The first thing I taste from the surface of these pieces is a light sweetness, and a light saltiness. Overall, a very light surface flavor. The chewing flavor starts out with a bit more sweetness, a slight tangy flavor which seems to resemble the pineapple juice as chewing continues. The light saltiness continues, but seems to have a little bit more definition as soy sauce. There's even a faint pungent flavor towards the end, which kinda resembles ginger. For being advertised as a Hawaiian variety, I suppose this stands up well to claim. That is, it seems to have that citrus-like tanginess of pineapple in the chewing, along with a light overall sweetness. But don't expect this jerky to taste like pineapple, it only has the tanginess of pineapple. Since foods advertised as "hawaiian" often include the flavor of teriyaki, I wondered if I might taste that in here. But I don't. This doesn't have the heavy sweetness normally associated with teriyaki, and the soy sauce flavor is also quite light. I don't taste any natural meat flavors in this. Several of these pieces are well marbilized, and I wondered if I might taste that fatty flavor, but only a little bit. There seems to be a light garlic aftertaste from this. Overall, the flavor you're going to notice the most in this is that pineapple-like tanginess, with the salt, sweet, and soy sauce flavors all in light intensity. These are slices of whole meat, sliced thin, and cut up into bite-sized pieces. It's a dry jerky that cracks open quite easily when bent. Yet, they have a soft, flexible feel. Tearing pieces apart with my fingers seems somewhat easy, while chewing is a bit more labored, though still on the easy-side. The chewing texture starts out feeling stiff, similar to a piece of soft plastic, with a bit of rubbery resistance. With some sucking and light biting, I can hear the crunch of the meat fibers breaking. It seems to chew down to a soft mass in about 20 seconds or so. At that point, it has a steak-like feel, more close to being well-done. There's a lot of fat marbilization on these pieces, but they don't seem to alter the flavor that much. I also encountered a fair amount of stringy sinews that seem to remain in my mouth as unchewable wads of tissue. Otherwise, no gristle or tendon. In terms of clean eating, it's very much so. My fingers don't pick up any residue, and no tiny fragments on my lap or desk, mainly due to being cut into bite sizes. Holston Mountain sells this Hawaiian variety from its website at a price of $6.00 for a 4oz package. I bought two packages, each a different variety. Add to that shipping costs of $4.20, and it brings a total of $16.20. That works out to a price of $2.03 per ounce. 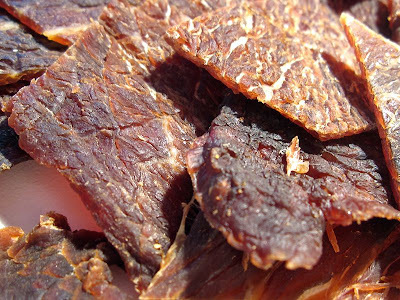 For general jerky snacking purposes, at the $2.03 price per ounce, it seems to offer a weak value. I get only a small amount of snackability from this, mainly because it doesn't provide enough flavor for me. The $2.03 price is higher than the mass-market brands, but yet this jerky doesn't really provide a better snackability for me. As a Hawaiian variety, it seems to offer a fair value at $2.03 per ounce. I get a clearly identifiable pineapple tanginess, which could be construed as being "Hawaiian". This Hawaiian variety from Holston Mountain Beef Jerky seems to live up to that billing for providing the tanginess of pineapple. Folks looking for something that evokes thoughts of wahines in grass skirts and laying out by the beach with a mai-tai, might find some satisfaction in this. I actually teetered back and forth on giving this a lower "fair" rating, because I didn't get much snackability. 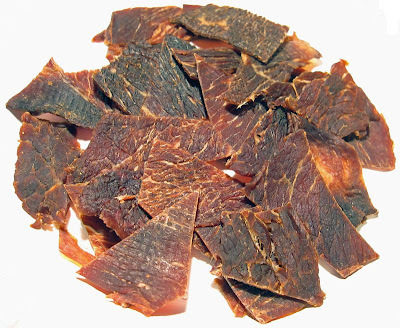 But I did find a little bit through its steak-like chewing texture, and the fact that it seems to hold up well to its "Hawaiian" description, I think it will provide a fair amount of satisfaction to folks wanting a Hawaiian style jerky. Personally, I think this jerky could belt out the Hawaiian theme more strongly with a thicker sweetness, and pieces of dried pineapple stuck the surface. My recommended beer pairing for this, try a hefeweizen, or wheat beer.